By Deborah T. Goldberg, M.S., David Maxwell, M.S. 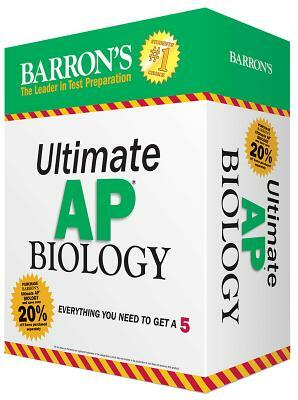 Find everything you need to score a 5 on your AP Biology examand save over 20% OFF items when purchased separately! This fully updated, must-have manual includes 3 full-length tests (two in the book and one online), all questions thoroughly answered and explained, an extensive review covering all AP test topics, hundreds of additional multiple-choice and free-response practice questions with answer explanations, test-taking tactics and strategies. 560 pp. Get concentrated test preparation with this handy, brand-new guide. It presents 600 questions with both correct and incorrect answers thoroughly explained to maximize your understanding of the content and concepts. 350 pp. Deborah Goldberg is passionate about Biology. She earned her B.S. and M.S. degrees in Biology at Long Island University. For fourteen years, she did cell research at NYU Medical Center and New York Medical College. For the following twenty-two years, she taught Biology, Chemistry, and Forensic Science at Lawrence High School in Cedarhurst, New York. David Maxwell has taught AP Biology at The Pingry School, an independent college preparatory school in New Jersey, for 16 years, and he has served as the Science Department Chair for four years. He has helped grade the AP Biology exam every year since 2004. David holds degrees from the University of Wisconsin (M.S. in Plant Pathology) and Juniata College (B.S. in Ecology). He lives with his family in a small town in rural New Jersey.